Last week was time to turn in our November Card Chicks creations. 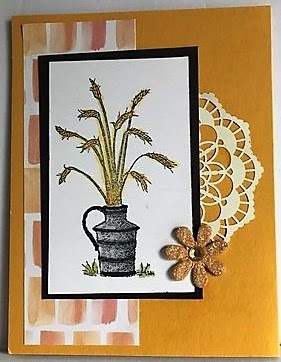 Suzy sent some great images and items. Leaves from Suzy's old teaching supplies stash. Mounted on Crushed Curry card base. 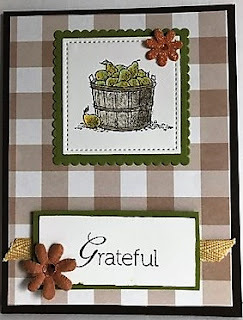 I added a 1/2 doily from Stampin' UP! 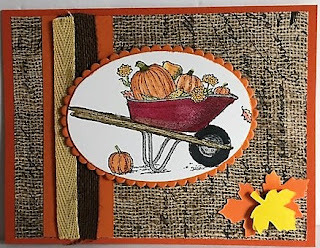 Mounted on Pumpkin Pie card base. I also added a strip of Pumpkin Pie card stock under the ribbon. All three cards are very pretty! Great use of the papers and embellishments.